Vitamin K2 is turning out to be the next royal darling in the kingly family for bone health. If Calcium was deemed the queen and Vitamin D was later found to be her king, Vitamin K2 is also a key building block in the relationship. Alongside Magnesium, zinc, boron, and phosphorus, K2 is turning out to be another synergistic component necessary for bone building. You may have heard about Vitamin K1, but most people are not aware of Vitamin K2 and the role it has in the body. Vitamin K1 is associated with blood clotting and it is mostly found in dark leafy greens. K2 on the other hand will not affect one’s blood clotting ability. One of K2’s main functions, is to place calcium where it needs to go in the body: the bones and the teeth. Too much calcium, without its necessary counterparts, leaves a greater chance of excess calcium. This could lead to it entering places where it shouldn’t be. Our muscles, tissues, kidneys, and heart could be at a higher risk for calcification if we have an underlying Vitamin K2 deficiency. Where do we get it and do we get enough of it? We can get it through food, we do have the ability to recycle some of it, and we can actually produce it ourselves as long as we have some good bacteria in our system to do so. The problems people face are: 1. We aren’t getting enough of it through our diet 2. We don’t have enough beneficial bacteria in general or enough of the K2 producing kind 3. There seems to be nutrient and drug interactions with it. Vitamin K2 food sources mostly come from animal and fermented foods. Although the highest known sources of K2 aren’t always the most common ones in our diet: natto a Japanese fermented soybean and goose liver is another rich source. If you can get past the taste, those are the best sources but slightly unrealistic to the average household. You can also acquire Vitamin K2 through dark chicken meat, hard cheeses, and eggs. More and more people have an imbalance of the healthy gut bacteria they would need to also aid in the production of K2. This is where other fermented foods and probiotics may be the most beneficial addition to your diet (as tolerated). Lastly, outside sources of supplementation and certain medications are found to reduce our levels of K2 further. For example, Vitamin D, although necessary to supplement if someone was found to be low, might be dropping our Vitamin K2 levels more. Something we were previously unaware of. Therefore, we are finding it is better to make sure they are present together. Since these advancements have helped us find K2 deficiencies more often than Vitamin D deficiencies, this doesn’t mean to supplement D and K2 to everyone. It’s important first to utilize lab work showing these deficiencies. But it does mean we need to account for further depletions in other nutrients when using supplementation. The most responsible way to increase our Vitamin K2 is to add these food sources in our diet. If you find it tolerable then this would help improve our gut bacteria levels. That being said, it is important to aim to get a variety in anything you eat. Make sure to alternate daily food sources to ensure coverage and avoid over exposure to any one food. Currently there are no official recommendations about Vitamin K2 amounts. The latest recommendations were made for total Vitamin K in 2001 before we learned more about all the benefits of K2. 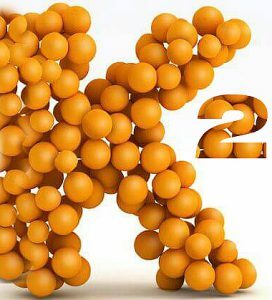 The USDA database of Vitamin K2 began in 2006. The latest research can give us some starting guidelines, but no official guidelines just yet. There are tests available to see a Vitamin K2 levels along with other nutrients if wanting to work with a professional more on this. Geleijnse JM, Vermeer C, Grobbee DE, Shurgers LJ, Knapen MH, Van Der Meer IM, Hofman A, Witteman JC. Dietary Intake of Menaquinone is Associated with a Reduced Risk of Coronary Heart Disease: The Rotterdam Study. J Nutr 2004; 134(11):3100-5.